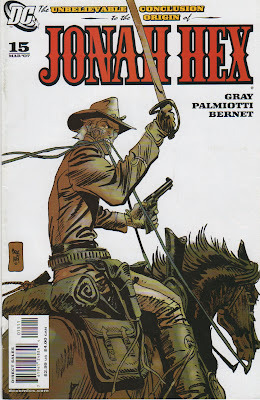 Matching Dragoons: Jonah Hex #15 V2 "Retribution, Part 3 of 3"
Jonah Hex #15 V2 "Retribution, Part 3 of 3"
"Retribution, Part 3 of 3"
Wilcox Apache Internment Camp, 1868 - We see several soldiers abusing the Indians that have been placed in their charge when suddenly a rifle cracks and men start falling. We find Jonah Hex up in the overlooking crags carefully drawing a bead time and again, dropping the soldiers with little to no effort. Finally Jonah rides into the fort with a wagon and addresses a very large Indian, Widow Maker. They exchange mild threats/greetings and it is revealed that they are old friends. Jonah is there to enlist Widow Maker's help in killing Col Ackerman because Ackerman has killed the Apache tribe that bought Jonah. Widow Maker asks if it is the same tribe that scarred Jonah's face. The Mark of The Demon - Jonah slowly rides towards the pueblo that he used to call home. When he arrives White Fawn greets him and says that Noh-Tante had said that Jonah was dead...things have changed. Then we learn that Noh-Tante and White Fawn are married. Jonah tells the chief of the chief's son's betrayal and lies and then challenges Noh-Tante to a battle to determine who is telling the true. A friend of Noh-Tante provides the tomahawks and points out which one is damaged. Noh-Tante instructs him to be sure that Hex gets the faulty tomahawk. The battle begins and during the fight Jonah's tomahawk breaks forcing him to pull a knife to defend himself after Noh-Tante gloats that he knew of the faulty handle. Unfortunately, Jonah kills Noh-Tante before the rest of the tribe can hear the confession. The penalty for cheating in a battle is death, however, since Jonah is a son of the chief, he shall not die. He will be branded so that the world will always know that Jonah carries the Mark of The Demon. On the Warpath - Jonah demands an answer from Widow Maker who pledges the power of himself and his men. They ride off with Widow Maker asking if more men will join them. Hex replies in the negative. Blood-Splattered Moon - Hex and Widow Maker hide in the rocks outside another fort. Hex points out the Gatling guns on the wall and says that they must be turned inward if they are to win. Inside, Ackerman is questioning his men on the lack of word on the shipment of guns he is expecting from Fulsome. Ackerman instructs his fellows to dispatch someone to find Fulsome in the morning and then asks how the recruiting is going. During the discussion we learn that Ackerman's plan is to raise up an army and venture forth into Mexico, destroying Mexicans and Apaches and eventually becoming a sovereign nation. 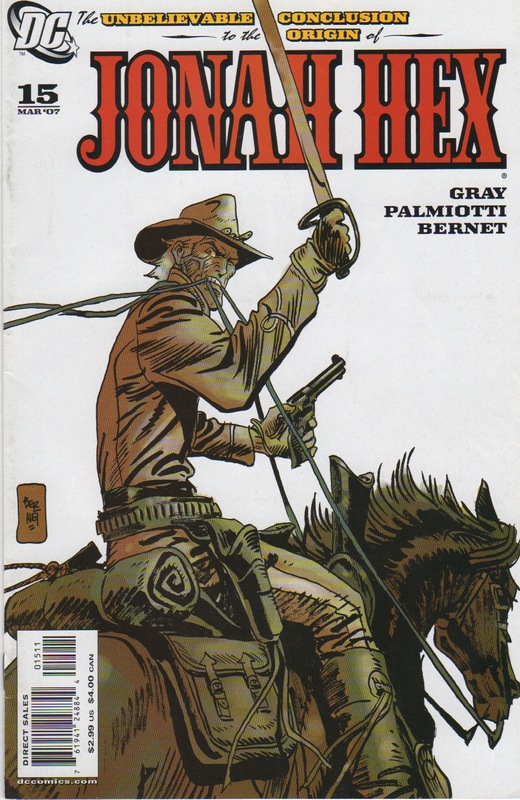 A soldier enters and tells Ackerman that someone is there to see him.... Jonah Hex. Ackerman asks if Hex is alone and to have him carefully disarmed and brought in. Hex explains that he came to inform them that Fulsome and his gang are dead and that the guns have been 'distributed accordingly'. Ackerman demands that Jonah get to the point and Hex tells him that Ackerman slaughtered an Apache camp not too long ago. Jonah wants to know why. Ackerman states that he needs no reason to slaughter savages, what were they to Hex. Jonah explains that they were his family and he is here to avenge them. Ackerman tells his men to prepare for an attack and one man leaves. As he opens the door he is shot dead and we find the Apache storming the fort. Jonah breaks out his knuckles and takes on Ackerman and the other man in the room. The Apache have topped the walls and Widow Maker is having free reign in the fort. Hex stabs the second man and Ackerman pulls his pistol but misses. The fight becomes hand to hand with Ackerman gripping Hex by the throat, choking the life from him. Jonah digs his thumbs into Ackerman's eyes, blinding him and then breaks a chair over his head, finally grabbing a busted chair leg and stabbing Ackerman to death with it. Widow Maker bursts in just in time to prevent a soldier from shooting Hex. Widow Maker offers Jonah a chance to head to Mexico with he and his men but Jonah says that he ain't a joiner...not anymore. Widow Maker asks what Jonah will do. Jonah says he will continue doing what he's doing. Finally Jonah rides off, declining the large Indian's offer of some of the gold they found in the fort. Timeline - 1868, flashback to 1866. The flashback covers a day. Current day, maybe a day or two. All in all, a good Jonah adventure with a nice dose of origin and some healthy action at the end. There were several nice touches in the dialogue and Bennet's artwork fits in very very nicely. It was enjoyable to see the origin through the eyes of the J's and then did a fine job. Next Issue - Things get really nasty and we get a double dose of ugly on top of it. I hope that you and your family weren't caught in the tornado! Is everything ok in your neck of the woods?